Wait...What Happened to the Ultimate Silhouette Sticker Guide?! And just like that the Ultimate Silhouette Sticker Guide is gone...kinda. But not really. After a lot of thought we've decided to re-brand my second full-length ebook with a new title and some additional content. You see the "sticker" reference just wasn't doing this 48 54 page ebook justice. After all, stickers are print and cut, but not every Silhouette user who does print and cut wants to make stickers. We thought the title of this Silhouette guide was not making it obvious to those who might be interested in other forms of print and cut that this is the ebook for them, too! Some Silhouette crafter want to make print and cut paper projects or print and cut vinyl decals or print and cut heat transfer or temporary tattoos...the list goes on. So for that reason we've re-released The Ultimate Silhouette Sticker Guide with a new name: The Ultimate Silhouette Print and Cut Guide! So is this book still for those who want to make (planner) stickers? YES! We still have all that fabulous material included in the book...as well as our free templates, printable color guide sheet, and sticker sets and a big ol' chapter on planner stickers! But we've added even more content so it's also helpful to those who want to make other forms of print and cut! We haven't remove any material...we've just re-organized the guide a bit and added some additional details, sections, and images. While we've made the book more broad to appeal to anyone who wants to work with Silhouette print and cut, we've moved everything specific to stickers to its own chapter. The same goes for those who are interested in print and cut vinyl decals or print and cut heat transfer! 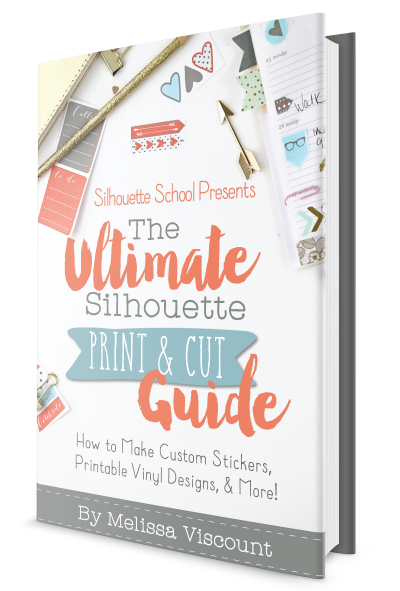 The Ultimate Silhouette Print and Cut Guide is 54 pages (up from 48 in its original form). We've kept the cover of the update version of the ebook very, very similar...and that's intentional. We don't want those who have already purchased the sticker guide to re-purchase this book - there's no need! 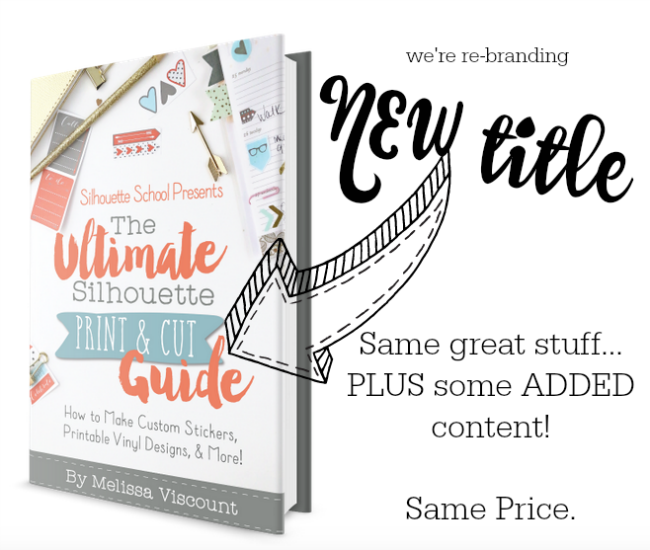 And in case you're wondering, all of our discounted Silhouette ebook bundles have also been updated to include the new version of The Ultimate Silhouette Print and Cut Guide. Will have another look at it now though. Thanks for access to the updated pages! Is it possible to also get a copy of the new cover? Pretty please? I am trying to make stickers for ornaments I have. I would like to scan in the ornament or use a photo to personalize only where the personalized area is. Should I do each ornament separately or fill the page using pix scan? Can I personalize once the scaling is done on ornament? I'm not sure where to start. Please can someone help me with this?? Great news, looking forward to seeing the 'additional pages'...And thanks for making us all look like slackers :) !